For the customer care provider of a smartphone manufacturer, I directed the UX design of the digital touchpoint between their users and a highly complex service and logistics network. Concept and UX design of the global customer care website for a mobile phone support provider. How do you offer customer service for millions of people around the world, in different languages and without exposing the underlying complexities of hardware support? ﻿B2X is a German IT service provider that offers customer care solutions for hardware manufacturers, mainly of mobile phones and IoT devices. 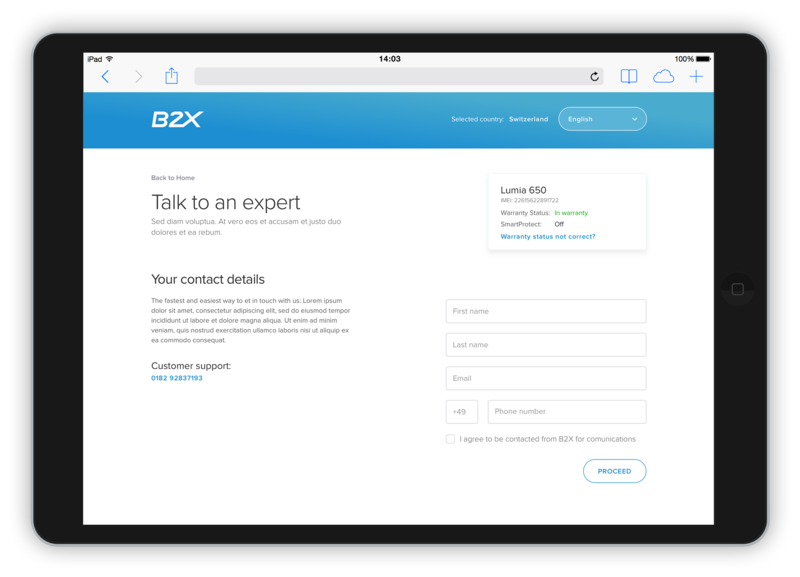 For a smartphone manufacturer’s product portfolio, B2X took over the global customer care including troubleshooting, product warranties, repair orders, product replacement and insurance. Our team of designers and front-end developers was asked to create the central customer service website that allows phone users to research information, run self-diagnostics, and get in touch with customer service agents on different channels – in 13 languages for more than 60 countries. What made the project additionally challenging was a very tight schedule of less than two months from first briefing to go-live, while our team was merely one part of the overall project setup, which included a backend team, mobile app developers, as well as IT specialists who had to set up and onboard entire call centers around the world. The initial design phase consisted of a series of quick iterations to create an overall information architecture and a comprehensive chart to visualize all process flows across the site. 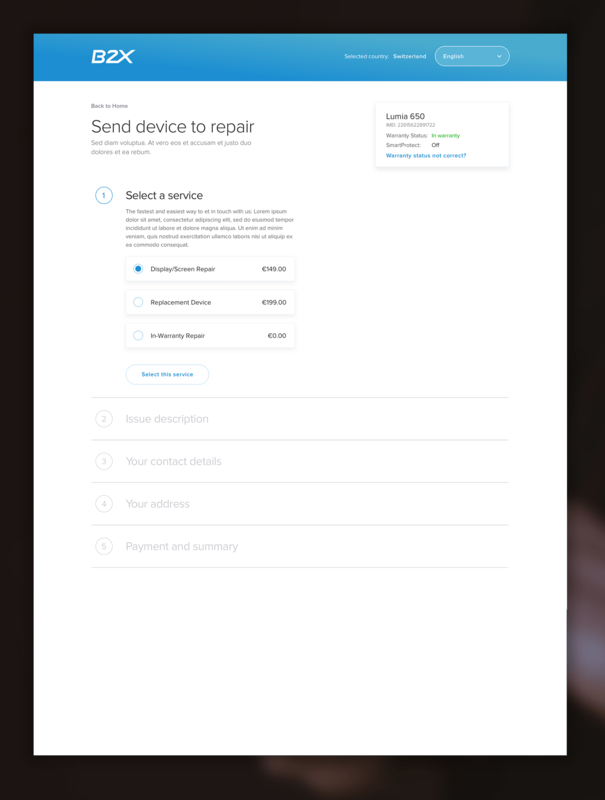 The concept saw up to four main process flows a user could choose from in order to receive assistance for a device that needs to be repaired or replaced: A chat or a phone call with a customer service agent, directions to visit the closest service store, or sending the device in by mail. Based on a variety of conditions that needed to be checked beforhand, e.g. whether a device is still under warranty or has an insurance protection, or in which the country the phone had been purchased, these basic process flows could take on very different forms, adding to the complexity of the underlying application logic. Using an agile approach to design and prototype the site’s different modules in short iterations, implementation for certain modules already started while other parts of the site were still in a design phase. The entire site launched on schedule and customer support was gradually switched over the course of a day, depending on the customers locations and time zones. 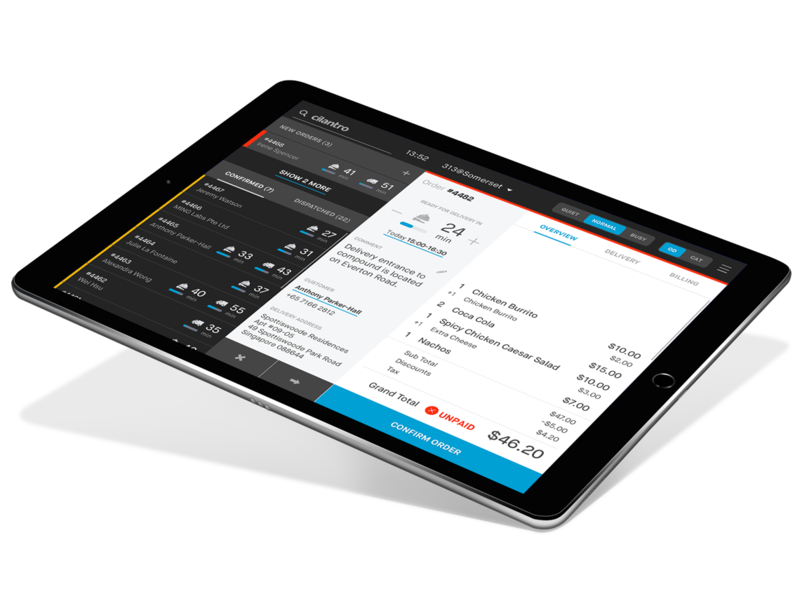 I've created the concept for a multi-platform service of an F&B logistics startup, directed the UX design team and built prototypes for the service's various applications.. I've created the concept for a multi-platform service of an F&B logistics startup, directed the UX design team and built prototypes for the service's various applications. © 2008 – 2017 Christian Behrens. All Rights Reserved. © 2008 – 2017 Christian Behrens.